"Health and Safety is important - it protects the public from carelessness and corner-cutting by those in charge of potentially dangerous structures. However, even the most stringent measures will not stop those who wilfully put themselves at risk. Marple Aqueduct is an example of a structure that is perfectly safe provided people stick to the towpath or stay on their boat. It is impossible to fall off this aqueduct from a boat, even if a boater were to trip or stumble as the off-side is quite wide. Only by deliberately stepping onto the off-side parapet can anyone be placed in danger and the extent of a potential fall can clearly be seen. Indeed this danger will be even more obvious after the invading tree growth is removed. A parapet or fencing on an aqueduct is clearly essential along the towpath side and they were all built with such, but the only reason for a fence on the off-side is to save the grossly irresponsible from themselves. The United States is the most litigious nation in the world yet even around the Grand Canyon only the designated viewing points are fenced. Elsewhere numerous sheer drops are unfenced and the public are warned: “you are responsible for your own safety”. This principle is one we are in danger of forgetting in the UK. Marple Aqueduct is a grade 2 listed structure and should be retained in its original condition. Extra fences should not be added except where ordinary members of the public would be at risk eg barriers at either end of the off-side to prevent people wandering onto the off-side. Clear notices need to be displayed at the ends of the aqueduct, in cruising guides and on the literature provided on hire boats warning people of the potential dangers (as is done with tunnels). If it is decided to fence the off-side at Marple, where does this stop? Do all aqueducts have to be fenced? What about Pontcysyllte – this is potentially far more dangerous than Marple as the off-side edge is merely inches wide. Are we to see this world heritage structure defaced with fencing? CRT’s responsibility is to protect the public from accidents which occur through no, or little, fault of the individual, not to eliminate risk caused by the stupid on themselves – they are responsible for their own safety." We are closely monitoring dimensions as BW had developed a worrying habit of reducing the dimension of a waterway as a means of avoiding dealing with some maintenance issues. This has led to some waterways becoming a ‘no-go’ area for historic boats. In particular we are campaigning for remedial work on Hurleston bottom lock to allow us all to gain access to the Welsh canals. We are also in discussions with CRT over dredging. CRT has now made a commitment to increasing the amount of dredging throughout the system and we are already seeing progress on this issue. We are working with CRT and National Historic Ships UK to compile a clear definitiion of what constitutes an historic vessel. This will enable a definitive register of historic craft to be maintained that will be recognised by NHS, CRT, the Boat Museum and HNBC. CRT is no longer able to maintain many of these and has disposed of some of them. The Club has given advice to CRT to help maximise the chances that these boats retain their historic value after they pass into new ownership. Registration plates for boats In the early 1970s CRT's predecessor, British Waterways (BW), introduced a scheme of registration plates for boats. These were to be permanently fixed either side of the bow. After representations from the Club, alternative fixing sites were agreed in a more traditional place on the rear cabin sides. BW's funding and maintenance backlog The Club supplied evidence for, and made representations to, the Fraenkel Committee set up to investigate (the then) BWs funding and maintenance backlog. These particularly related to navigable dimensions for craft on different waterways at the time of the 1968 Transport Act and to which BW/CRT are now bound to adhere or improve upon. Paddle gear and Spindle sizes Early representations were made concerning paddle gear and spindle sizes as after implementation, new problems were found. CRT/BW admitted there was still a safety problem and are slowly taking corrective action to ensure that only the correct sized windlass can be used. Steam powered craft in tunnels A satisfactory solution to questions raised concerning steam powered craft in tunnels was found and a code of practice produced in conjunction with the Steam Boat Association of Great Britain. Licence Discounts A 10% licence discount for historic craft was agreed with BW and continues with CRT. We also obtained discounts for butties paired with motor boats. Boat Safety Scheme The present Boat Safety Scheme was born out the former Certificate of Compliance scheme which was applied, by the then British Waterways, to hire craft in the late 1970s - always with the proviso that a similar scheme would eventually be implemented for all craft. At that time the Club made certain representations - some of which were included as exemptions in the first drafts (ca 1990) of the present scheme. The Club has supported throughout the principle of such a scheme, although has frequently disagreed with BW/CRT on the necessity for and content of much of the present detail. Since 1992 frequent consultations have taken place and an increasing number of issues resolved. Read about them here. Gate paddles: On the Leicester Section of the GU, pressure from the Club resulted in a promise of gate paddles being fitted to all new top gates. VHF Radio: The Club persuaded the Port of London Authority to relax their requirement that craft over 20m long should have VHF radio from the passage from Brentford to Teddington. Lock structures The Club initiated a campaign which resulted in BW’s then chairman, George Greener, agreeing to work towards the modification of lock structures so that they would be capable of passing a 7’ wide boat. Although this has not always been honoured, we continue to pursue this and it remains the Club's aim. Coal chutes at Smethwick: Unfortunately, the 1930s coal chutes at Smethwick were not saved despite a vigorous campaign, but English Heritage had already advised that they were beyond repair. Nevertheless BW undertook to employ a specialist architectural recorder to photograph the site before demolition and to collate documents about the chutes. 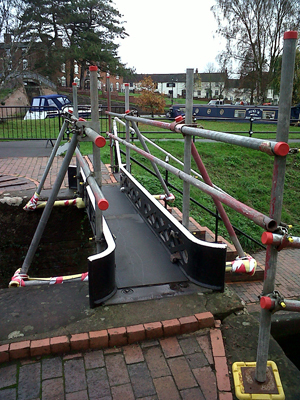 Lock tail bridges: The Club was alarmed at the appearance of scaffolding or wooden bridges that appeared on the tail bridges at locks on the Staffordshire & Worcester and the Trent & Mersey Canals. These appeared to be in response to an incident in June 2011 when a boy fell into a lock and drowned when riding his bicycle across a tail gate bridge at Stourbridge. While extending every sympathy to the boy's family for their sad loss, we were concerned that CRT's proposed new handrails for these bridges, and some bridge closures, would make lock operation less safe for the many boaters using them then and in the future. We were also worried that inappropriate designs would detract from the heritage value of these unique bridges. We lobbied strongly that there should not be an over-reaction to this issue as CRT's own records show that accidents on these bridges have been extremely rare. There has been considerable discussion between the Club and CRT on this matter Click here for more details and sample drawings. Marsworth Yard: We made a formal objection to Aylesbury Vale District Council concerning the development plans for the yard as we felt that insufficient attempts had been made to preserve the heritage features of this important canal junction. We believed that the submitted plans did not follow the approach that was recommended on the Heritage Survey that CRT/BW commissioned before the project started. To see a copy of the objection we submitted, click here. Following withdrawal of the planning application, public meetings to consult on revised plans were held in April 2010. New plans, submitted in July 2010, took into account the objections raised and proposed creating 12 residential units, converting the carpenter's shop into another unit, refurbishing and retaining the operational crane in its current position, and upgrading the boaters' facilities in their current position. Back cabin stoves: We made strong representations to the BSI working party that was developing standards for solid fuel stoves. The first draft of these standards would have outlawed traditional back cabin stoves. This was changed and traditional stove installations are exempt. To see a copy of the summary points in the submission, click here. Feedback from the moderators was positive. Long Horse Bridge, Derwentmouth: Long Horse Bridge carried the towpath from the Trent and Mersey Canal across the upstream arm of the River Trent and enabled boats to be towed from the canal onwards down the River Trent. Originally a wooden bridge, the last reconstruction was a concrete bridge erected by the Trent Navigation Company in 1932. The bridge was demolished by the then BW in 2003, allegedly on health and safety grounds, cutting off the towpath. Derbyshire County Council planned to make a new, wide, multi-purpose bridge south of the old bridge – it will no longer be possible to tow a craft from the downstream River Trent to the Trent & Mersey canal. The Club supported the Shardlow Heritage Trust in its campaign to have a new bridge constructed in the original position. This is important for boaters’ safety as well as keeping alive the waterways heritage value of this important canal and river junction. The campaign was not successful and the new bridge was installed in the Councty Council's preferred location in September 2011. GU Gate Paddles: Despite undertakings from the then managers (Derek Newton GU Leicester Section, Caroline Clarke GU South and Simon Ainley GU Central) at various local User Group meetings that gate paddles would be fitted to new top gates on locks that originally had such paddles, some are still being made without them. It was our understanding that following the re-organisation of the then BW workshops into two main ones to cover the whole country, the correct patterns for gates had been sent to Stanley Ferry (wide locks) and to Bradley (narrow locks), so that there would be some consistency. However, the above personnel are no longer in post and CRT/BW’s latest re-organisation may have thrown all this into doubt, so we will continue to keep up the pressure. Tipton Gauging Station, Factory Locks, BCN: The Club gave strong support to the BCNS, Dudley Canal Trust and the IWA local branch in their campaign to prevent the loss of Tipton Gauging Station – although it is a Grade II listed building, the waterway access to it is not. Approval of the developer’s plans was initially suspended in May 2007 by the Sandwell Metropolitan District Council’s Planning Committee but planning permission was eventually given later in 2007 and was in place for a 3 year period. Read more about it on the Black Country Society's webpage.